Writing persuasive copy is not easy, & for some odd reason it seems to bring out the cheesiness in all of us. As soon as we try to tell the world about our great product, we start sounding like an infomercial… & we all know how everyone feels about infomercials. 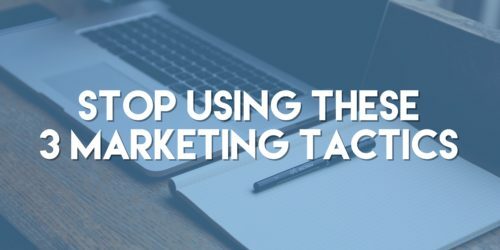 Whether you are writing for an ad, a brochure, a website, or even for a video script, it is important to avoid these three (annoying) marketing tactics. Simply being aware of what you might want to avoid, will help you push through the cheesy tendencies to stronger copy that will convert better. Do youuu want to be a better marketer? Then read this blog post. I catch myself doing this all the time… I write a cheesy question, & then I have to stop myself & rewrite it in a way that sounds less patronizing. However, these questions are not necessarily a bad starting place. Write out the question & answer, & then rework it. Think about the point that you are trying to get across, & who you are trying to speak to. Give your audience credit for being intelligent human beings. You don’t need to lure them in with a phony question. For example, the title of this blog post is enough to convey that it is meant for marketers who want to be better at their job. It lets people know what to expect, & it lets them decide whether or not it is something valuable to them. We have the best furniture in the city! This type of “promotional” language has lost all of its impact (if it ever had any impact). Everyone says that they’re the best… it means nothing. There is nothing that grabs my attention about this statement, & it could actually have a negative impact on my opinion of your business. Instead of using this vague language, use real figures or state what sets you apart from competitors. For example, use ad space to tell customers about the gorgeous wood that you use to craft your furniture that in no way compares to the particle board furniture you’d buy from Walmart. Or to let them know that you do custom furniture to match their current home. Or even take the space to teach them about how to choose furniture that will last for generations or create the perfect living room. Happy (insert whatever holiday is currently happening here) from all of us (insert your company here)! Unless it is a major holiday, or it is a holiday that has something directly to do with your business, leave it alone. This also applies to any trending events or hashtags that might be happening in the world. Many businesses have the idea that jumping on trends will get them noticed, & it might… but it is kind of like the people who jump around outside the window of The Today Show. They get noticed, but everyone thinks they’re a little obnoxious, & everyone forgets about them quickly. It is important for businesses to stay in their lane. Speak to your target audience & about what is important to them. Of course if something is trending that has to do with your business, jump on that opportunity! Otherwise, it has no value to you. The bottom line is that you want to focus on value. What is valuable to your customer? What sets you apart from your competitors? What do you want to teach your audience? You can absolutely bring value through your marketing material once you get away from the normal cliches.